After a kings-versus-aces cooler, Matt Berkey contemplates a big king-high call on "Poker After Dark." Matt Berkey: "I just wish I had a pair." Looking at a high-stakes hero call on "Poker After Dark." 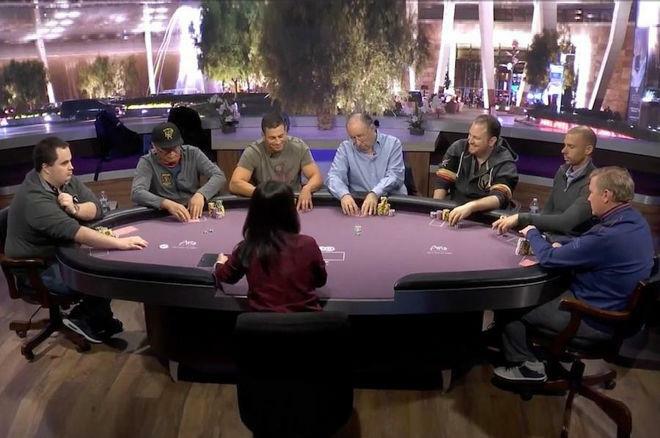 The folks at PokerGO have provided more entertaining poker action to fill the first part of the short Thanksgiving week with two days' worth of high-stakes cash games at the ARIA Resort & Casino. The shows were dubbed "Leave it to Seiver," another entry in the new Poker After Dark series. The first night saw the game's namesake, Scott Seiver, joined by Matt Berkey, Ben Lamb, Garrett Adelstein, Bob Bright, Jacky Wang, Allan Hu, and Christopher Kruk, most of whom were there for the second night as well. With a $100,000 minimum buy-in, the game began with $200/$400 blinds (and the usual occasional straddles) before upping to $300/$600, and there was plenty of action and big pots from the very start. A little over an hour into play on Monday, Matt Berkey found himself involved in a huge hand versus Garrett Adelstein. Following an Adelstein straddle, Berkey had been dealt , but Adelstein had picked up . Preflop action saw Berkey flat-calling a five-bet by Adelstein, then Berkey flopped a set when the first three community cards came . About an hour later, Berkey was involved in another intriguing hand with Christopher Kruk. The blinds were $300/$600 for this one, with Berkey and Kruk both starting the hand with around $90K. Having been dealt , Kruk opened for $1,500 from under the gun. After Bob Bright called from the hijack seat, Berkey looked down at and called from the button, making the pot $6,100. The three players saw the flop come , and Berkey checked. With top two pair Kruk led for $2,100, scattering Bright. Berkey had the nut-flush draw and a gutshot to Broadway and called. The turn was the . 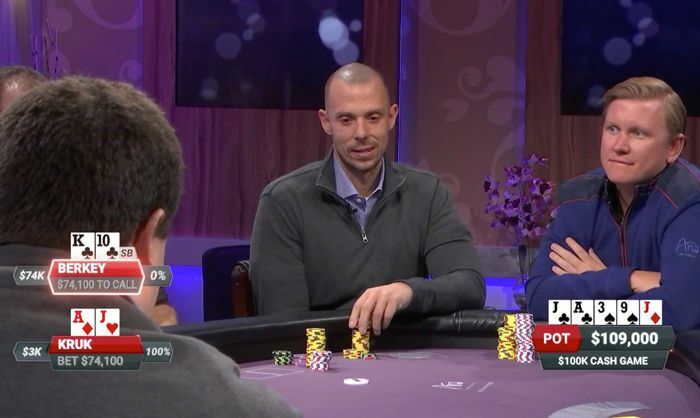 Berkey checked again and watched Kruk make a big overbet of $12,300 — more than the size of the $10,300 pot. Berkey thought a short while before making the call. With the pot up to $34,900, the river brought the , meaning Berkey had missed his draws and Kruk had improved to a full house. Kruk sat quietly for close to a minute, then announced he was all in for the $77,000 he had behind — just about $3K more than what Berkey had left. Berkey smiled right away, and began to talk. "I'm pretty sure you're bluffing, but I don't think I can call," he said before settling into further contemplation. "I just wish I had a pair," he continued a little later, describing the situation as "brutal." "If I only had a pair, I would have called already," he added, still grinning. In his commentary, Hanks pointed out how "this would be the definition of a hero call." Indeed, with only king-high Berkey was in a position where he could only possibly beat a bluff. Berkey himself had missed a couple of draws, and was no doubt thinking over the possibility that Kruk could have also been going for one of the possible straight or flush draws and had likewise missed with that board-pairing river card. Hanks went on to explain how Kruk's overbets on both the turn and river made him seem especially polarized, either having the "stone nuts" or an "airball." After more than four minutes in the tank, Berkey did come up with the "hero call," and Kruk tabled his hand to show him the bad news. "Good hand," said Berkey who decided to call it a night at that point. Berkey would return last night, as did Kruk who enjoyed more success Tuesday night. Both nights, totaling nearly 11 hours' worth of action, can be seen along with all of the other archived action on PokerGO.